Internet radio services are usually accessible from anywhere in the world with a suitable internet connection available; one could, for example, listen to an Australian station from Europe and America. This has made internet radio particularly suited to and popular among expatriate listeners. Nevertheless, some major networks like CBS Radio, Pandora Radio, and Citadel Broadcasting (except for news/talk and sports stations) in the United States, and Chrysalis in the United Kingdom, restrict listening to in-country due to music licensing and advertising issues. Internet radio is also suited to listeners with special interests that are often not adequately served by local radio stations. 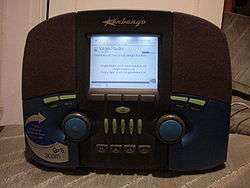 Internet radio is typically listened to on a standard home PC or similar device, through an embedded player program located on the respective station's website. In recent years, dedicated devices that resemble and offer the listener a similar experience to a traditional radio receiver have arrived on the market. Streaming technology is used to distribute Internet radio, typically using a lossy audio codec. Streaming audio formats include MP3, Ogg Vorbis, Windows Media Audio, RealAudio, and HE-AAC (or aacPlus). Audio data is continuously transmitted serially (streamed) over the local network or internet in TCP or UDP packets, then reassembled at the receiver and played a second or two later. The delay is called lag, and is introduced at several stages of digital audio broadcasting. A local tuner simulation program includes all the online radios that can also be heard in the air in the city. In 2003, revenue from online streaming music radio was US$49 million. By 2006, that figure rose to US$500 million. A February 21, 2007 "survey of 3,000 Americans released by consultancy Bridge Ratings & Research" found that "[a]s much as 19% of U.S. consumers 12 and older listen to Web-based radio stations." In other words, there were "some 57 million weekly listeners of Internet radio programs. More people listen to online radio than to satellite radio, high-definition radio, podcasts, or cell-phone-based radio combined." An April 2008 Arbitron survey showed that, in the US, more than one in seven persons aged 25–54 years old listen to online radio each week. In 2008, 13 percent of the American population listened to the radio online, compared to 11 percent in 2007. Internet radio functionality is also built into many dedicated Internet radio devices, which give an FM like receiver user experience. In the fourth quarter (Q4) of 2012, Pandora and other subscription-based and free Internet radio services accounted for nearly one quarter (23 percent) of the average weekly music listening time among consumers between the ages of 13 and 35, an increase from a share of 17 percent the previous year. As Internet-radio listening rose among the 13-to-35 age group, listening to AM/FM radio, which now accounts for 24 percent of music-listening time, declined 2 percentage points. In the 36-and-older age group, by contrast, Internet radio accounted for just 13 percent of music listening, while AM/FM radio dominated listening methods with a 41 percent share. Currently, 47% of all Americans ages 12 and older -- an estimated 124 million people -- said they have listened to online radio in the last month, while 36% (94 million people) have listened in the last week. These figures are up from 45% and 33%, respectively, in 2013. The average amount of time spent listening increased from 11 hours, 56 minutes per week in 2013 to 13 hours 19 minutes in 2014. As might be expected, usage numbers are much higher for teens and younger adults, with 75% of Americans ages 12-24 listening to online radio in the last month, compared to 50% of Americans ages 25-54 and 21% of Americans 55+. The weekly figures for the same age groups were 64%, 37% and 13%, respectively. In November 1994, a Rolling Stones concert was the "first major cyberspace multicast concert." Mick Jagger opened the concert by saying, "I want to say a special welcome to everyone that's, uh, climbed into the Internet tonight and, uh, has got into the M-bone. And I hope it doesn't all collapse." On November 7, 1994, WXYC (89.3 FM Chapel Hill, NC USA) became the first traditional radio station to announce broadcasting on the Internet. WXYC used an FM radio connected to a system at SunSite, later known as Ibiblio, running Cornell's CU-SeeMe software. WXYC had begun test broadcasts and bandwidth testing as early as August 1994. WREK (91.1 FM, Atlanta, GA USA) started streaming on the same day using their own custom software called CyberRadio1. However, unlike WXYC, this was WREK's beta launch and the stream was not advertised until a later date. Time magazine said that RealAudio took "advantage of the latest advances in digital compression" and delivered "AM radio-quality sound in so-called real time." Eventually, companies such as Nullsoft and Microsoft released streaming audio players as free downloads. As the software audio players became available, "many Web-based radio stations began springing up." In March 1996, Virgin Radio - London, became the first European radio station to broadcast its full program live on the internet. It broadcast its FM signal, live from the source, simultaneously on the Internet 24 hours a day. With the advent of streaming RealAudio over HTTP, streaming became more accessible to a number of radio shows. 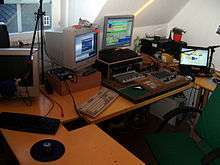 One such show, TechEdge Radio in 1997 was broadcast in 3 formats - live on the radio, live from a RealAudio server and streamed from the web over HTTP. In 1998, the longest running internet radio show, "The Vinyl Lounge", commenced netcasting from Sydney, Australia, from Australia's first Internet Radio Station, NetFM (www.netfm.net). In 1999, Australian Telco "Telstra" launched The Basement Internet Radio Station but it was later shut down in 2003 as it was not a viable business for the Telco. From 2000 onwards, most Internet Radio Stations increased their stream quality as bandwidth became more economical. Today, most stations stream between 64 kbit/s and 128 kbit/s providing near CD quality audio. A rancorous dispute ensued over how performance royalties should be assessed for Internet broadcasters. Some observers said that royalty rates that were being proposed were overly burdensome and intended to disadvantage independent Internet-only stations—that "while Internet giants like AOL may be able to afford the new rates, many smaller Internet radio stations will have to shut down." The Digital Media Association (DiMA) said that even large companies, like Yahoo! Music, might fail due to the proposed rates. Some observers said that some U.S.-based Internet broadcasts might be moved to foreign jurisdictions where US royalties do not apply. Many of these critics organized SaveNetRadio.org, "a coalition of listeners, artists, labels and webcasters" that opposed the proposed royalty rates. To focus attention on the consequences of the impending rate hike, many US Internet broadcasters participated in a "Day of Silence" on June 26, 2007. On that day, they shut off their audio streams or streamed ambient sound, sometimes interspersed with brief public service announcements voiced, written and produced by popular voiceover artist Dave Solomon. Notable participants included Rhapsody, Live365, MTV, Pandora, Digitally Imported and SHOUTcast. Some broadcasters did not participate, such as Last.fm, that had just been purchased for US $280 million by CBS Music Group. According to a Last.fm employee, they were unable to participate because participation "may compromise ongoing license negotiations." SoundExchange, representing supporters of the increase in royalty rates, pointed out the fact that the rates were flat from 1998 through 2005 (see above), without even being increased to reflect cost-of-living increases. They also declared that if internet radio is to build businesses from the product of recordings, the performers and owners of those recordings should receive fair compensation. SoundExchange has also offered alternative rates and terms to certain eligible small webcasters, that allows them to calculate their royalties as a percentage of their revenue or expenses, instead of at a per performance rate. To be eligible, a webcaster had to have revenues of less than US $1.25 million a year and stream less than 5 million "listener hours" a month (or an average of 6830 concurrent listeners). These restrictions would disqualify independent webcasters like AccuRadio, Digitally Imported, Club977 and others from participating in the offer, and therefore many small commercial webcasters continue to negotiate a settlement with SoundExchange. An August 16, 2008 Washington Post article reported that although Pandora was "one of the nation's most popular Web radio services, with about 1 million listeners daily...the burgeoning company may be on the verge of collapse" due to the structuring of performance royalty payment for webcasters. "Traditional radio, by contrast, pays no such fee. Satellite radio pays a fee but at a less onerous rate, at least by some measures." The article indicated that "other Web radio outfits" may be "doom[ed]" for the same reasons. In January 2009, the US Copyright Royalty Board announced that "it will apply royalties to streaming net services based on revenue." Since then, websites like Pandora Radio, AccuRadio, Mog, 8tracks and even recently Google Music have changed the way people discover and listen to music. The Webcaster Settlement Act of 2009 expired in January 2016, ending a 10-year period in which smaller online radio stations, Live365 among them, could pay reduced royalties to labels. On January 31, 2016, webcasters who are governed by rules adopted by the Copyright Royalty Board were required to pay to SoundExchange an annual, nonrefundable minimum fee of $500 for each channel and station. the fee for services with greater than 100 stations or channels being $50,000 annual. ↑ Hoeg, Wolfgang; Lauterbach, Thomas (2009). Digital audio broadcasting: principles and applications of DAB, DAB+ and DMB. Wiley. p. 26. ISBN 978-0-470-51037-7. 1 2 3 4 Olga Kharif, The Last Days of Internet Radio?, March 7, 2007. Retrieved on March 7, 2007. ↑ The "HD" in "HD radio" actually stands for hybrid digital, not high-definition. It's hybrid because analog and digital signals are broadcast together. ↑ Joe Lensky; Bill Rose (June 24, 2008). "The Infinite Dial 2008: Radio's Digital Platforms" (PDF). Digital Radio Study 2008. Arbitron and Edison Research. ↑ "Weekly online radio audience increases from 11 percent to 13 percent of Americans in last year, according to the latest Arbitron/Edison media research study". Arbitron & Edison Research. Red Orbit. April 9, 2008. ↑ "Internet Talk Radio". museum.media.org. Retrieved May 30, 2010. ↑ "Cable company is set to plug into Internet". The Wall Street Journal. August 24, 1993. Retrieved March 18, 2008. ↑ Randy Alfred (June 24, 2009). "This day in Tech". Wired. Retrieved April 11, 2013. ↑ Peter H. Lewis (February 8, 1995). "Peering Out a 'Real Time' Window". New York Times. Retrieved February 9, 2009. ↑ WXYC's groundbreaking internet simulcast is now 10 years old November 12, 2004. WXYC Chapel Hill, NC, 89.3 FM. ↑ We got here first. Sort of. WREK Atlanta, 91.1 FM. ↑ Josh Quittner (May 1, 1995). "Radio Free Cyberspace". Time. Retrieved March 5, 2009. 1 2 Richard D. Rose (May 8, 2002). "Connecting the Dots: Navigating the Laws and Licensing Requirements of the Internet Music Revolution" (PDF). IDEA: The Intellectual Property Law Review. Retrieved March 5, 2009. ↑ Adam Bowie (September 26, 2008). "A brief history of Virgin Radio". One Golden Square. Retrieved March 30, 2009. ↑ "An Introduction to Internet Radio" (PDF). European Broadcasting Union (EBU). October 26, 2005. Retrieved July 26, 2016. 1 2 Saul Hansell (July 20, 1998). "Broadcast.com Faces Risks After Strong Initial Offering". New York Times. Retrieved November 23, 2008. ↑ "Yahoo! Completes Broadcast.com Acquisition". Yahoo! Media Relations. July 20, 1999. Retrieved January 10, 2009. 1 2 Doc Searls, (July 17, 2002) "Why Are So Many Internet Radio Stations Still on the Air?" Linux Journal. Retrieved March 14, 2010. ↑ National Film & Sound Archive (September 20, 2010). "National Film & Sound Archive". National Film & Sound Archive. ↑ Stockment, Andrew (December 2009). "Internet Radio: The Case for a Technology Neutral Royalty Standard". Virginia Law Review. Retrieved October 6, 2013. 1 2 3 Michael Roberts (May 2, 2002). "Digital Dilemma: Will new royalty fees kill Web radio?". Westword. Retrieved March 14, 2010. 1 2 Carlos Militante (April 26, 2007). "Stagnant royalty rates may bring end to Internet radio". Spartan Daily (San Jose State U.). The Daily Collegian. Archived from the original on February 9, 2008. Retrieved March 14, 2010. 1 2 Michael Geist (April 9, 2007). Web radio may stream north to Canada. The Toronto Star. 1 2 Gray, Hiawatha (March 14, 2007). Royalty hike could mute Internet radio: Smaller stations say rise will be too much, The Boston Globe. ↑ Broache, Anne (April 26, 2007). "Lawmakers propose reversal of Net radio fee increases". CNet News. Archived from the original on January 19, 2013. Retrieved March 14, 2010. ↑ Official SaveNetRadio PSAs & Day Of Silence Network Audio. The Toronto Star. ↑ Duncan Riley (May 30, 2007). CBS Acquires Europe’s Last.FM for $280 million Techcrunch. Retrieved March 14, 2010. ↑ Russ Garrett (June 25, 2007). Post by Russ on Last.fm Forum - Day of Silence, June 25, 2007. Retrieved June 24, 2012. ↑ Olga Kharif (August 23, 2007). "Webcasters and SoundExchange Shake Hands". BusinessWeek.com. Retrieved August 24, 2007. ↑ Mark Hefflinger (August 22, 2007). "SoundExchange Offers Discounted Music Rates To Small Webcasters". DigitalMediaWire.com. Retrieved August 24, 2007. ↑ Rusty Hodge, (August 1, 2007) SoundExchange extends (not very good) offer to small webcasters. SomaFM. Retrieved March 14, 2010. ↑ David Oxenford (September 19, 2007) SoundExchange Announces 24 Agreements - But Not One a Settlement With Small Webcasters. Broadcast Law Blog. ↑ Peter Whoriskey (August 16, 2008) Giant Of Internet Nears Its 'Last Stand'. The Washington Post. Retrieved March 14, 2010. 1 2 Miller, Cain Claire (Oct.27, 2008) Even If Royalties for Web Radio Fall, Revenue Remains Elusive, The New York Times. ↑ Scott M. Fulton, III (January 29, 2009) Copyright Board begrudgingly adopts revenue-based streaming royalties. BetaNews.com. Retrieved March 14, 2010. ↑ "2016 Broadcasters Calendar" (PDF). wbklaw.com. Wilkinson Barker Knauer LLP. Retrieved 2016-02-01. ↑ "commercial webcaster 2016 rates". soundexchange.com. soundexchange. Retrieved 2016-02-01. Priestman, Chris (2001). Web Radio: Radio Production for Internet Streaming. Focal Press. ISBN 978-0-240-51635-6. Stockment, Andrew (2009). "Internet Radio: The Case for a Technology Neutral Royalty Standard". Virginia Law Review. 95 (8). Retrieved March 17, 2015. Villasenor, John (2012). "Digital Music Broadcast Royalties: The Case for a Level Playing Field" (PDF). Issues in Technology Innovation. 19. Retrieved March 17, 2015. DiCola, Peter. "Copyright Equality: Free Speech, Efficiency, and Regulatory Parity in Distribution" (PDF). Boston University Law Review. 93 (6). Retrieved March 17, 2015.